Microsoft's upcoming feature update for Windows 10 will be named the October 2018 Update and Windows 10 version 1809. The company ended the previous scheme for names that used the seasons to the informative but rather boring "launch month and year" scheme when it released the April 2018 Update in April 2018. The new name scheme for updates is less confusing than last year's Spring and Fall updates which one half of the globe could not really related to at all, but it is not without issues. The April 2018 Update for instance was Windows 10 version 1803 suggesting a March 2018 release, and the upcoming October 2018 Update is Windows 10 version 1809, suggesting a September 2018 release. The feature update for Windows 10 includes a number of big changes and additions and lots of smaller changes. We parsed all Windows 10 Insider Build release notes that Microsoft published and other official sources to compute the list. Note that the list is not complete. We made the decision to focus on important features and changes only. 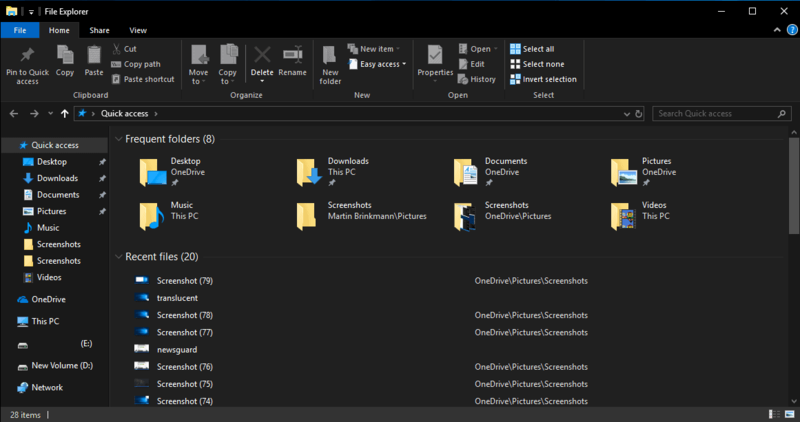 A dark theme for the built-in file manager was a much requested feature according to Microsoft and while many users have heralded Microsoft for introducing a dark theme for File Explorer, others have criticized the company for how it implemented the theme. While users have plenty of ways to capture screenshots in Windows 10 already, Microsoft decided that another option could not hurt. 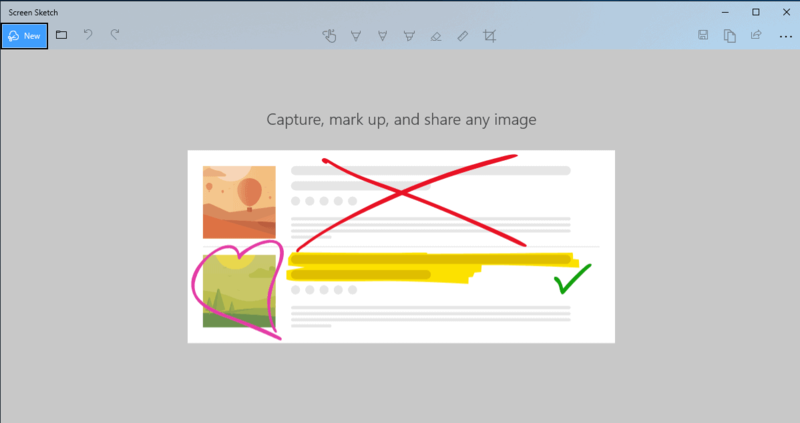 The new Screen Sketch tool is set to replace the veteran Snipping Tool on the operating system. Users of Windows 10 version 1809 can use the keyboard shortcut Windows-Shift-S to enable capture mode. It is then possible to take a fullscreen, rectangular, or freehand screenshot. Note: Windows 10 version 1809 users and admins can map the Screen Sketch tool to the Print-key on the keyboard. Just go to Settings > Ease of Access > Keyboard, and make sure "Use the PrtScr button to open screen snipping" is set to on. Users do find a new Screen Snip action in the Quick Actions menu of the Action Center. The new version of Windows 10 comes with extended web searching functionality. Bing's result page may be displayed when you search for a term that Windows can't link files, folders or settings to on the device. The October 2018 Update comes with two improvements to the built-in Clipboard. It is now possible to enable a feature called Clipboard History to access past Clipboard entries with the shortcut Windows-V. The feature works similarly to how other Clipboard Managers for Windows handle the Clipboard history. The second feature allows users to sync Clipboard entries between devices. You can turn both features on or off under Settings > System > Clipboard. 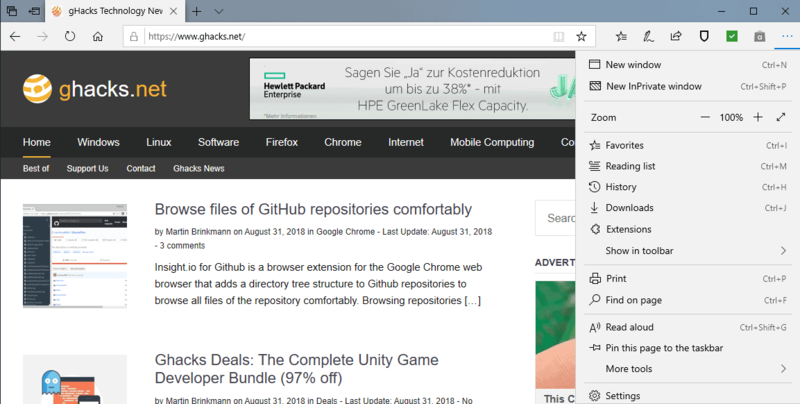 Microsoft Edge gets lots of improvements in feature updates all the time and the new Windows 10 October 2018 Update is no exception to that unwritten rule. Edge users will notice the new sidebar menu that makes things a bit clearer (although it still can't be opened in its own tab). There is also an option to disable media autoplay in the Settings of the browser under Advanced and control media autoplay on a per-site basis with a click on the (i) icon in the browser's address bar and the selection of "manage permissions". Microsoft Edge's built-in PDF Reader got updated with new functionality that includes adding notes and pinning PDF documents to the taskbar. There is also a new look-up feature in Reading View and PDF modes. A right-click on a download displays the new "show in folder" option which is handy as it opens File Explorer right away. The browser features many under-the-hood changes, new APIs such as Web Authentication that are now supported in the new version. As always, these changes are not backported to older versions of Windows 10. Also, a bunch of new policies for Microsoft Edge that admins can configure in the Group Policy editor. Tip: Edge preloads on Start. You can disable that using the Group Policy or Registry. The default text editor Notepad received some love in Windows 10 version 1809. The text editor supports Macintosh and Unix/Linux line endings in the new version which should do away with text that looks messed up in the editor. Other options include zooming in and out, and support for line numbers when word wrap is activated. 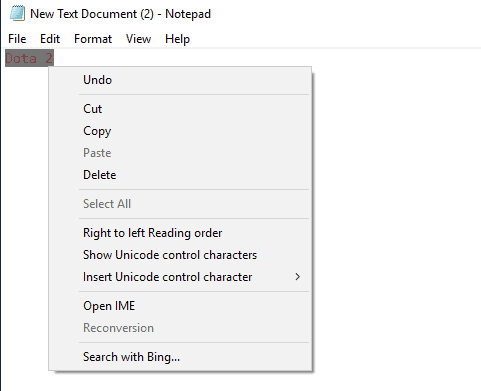 Users of Notepad can run searches with Bing when they highlight text in Notepad and right-click on the selection afterward. Windows Update's automatic restart feature to install updates has received criticism in the past. Users reported that Windows Update would restart the Windows PC at inappropriate times which made them lose work, drop out of games, or spend the next hour or two troubleshooting updating issues. Microsoft revealed that it uses machine learning to better determine the right moment to install updates and restart the computer. Whether that is really working as Microsoft envisions it remains to be seen. The Windows Diagnostic Data Viewer displays Problem Reports as well now in the new version of Windows 10. Windows Defender Security Center renamed to Windows Security. Windows Security supports a new "block suspicious behavior" option under Virus & Threat Protection > Manage Settings which enables Windows Defender Exploit Guard. On systems that support it, Edge can be run in isolation mode by going to App & Browser Control under Windows Security and selecting "Install Windows Defender Application Guard". Search support added to the Calendar application. Option to increase text size under Settings > Ease of Access > Display > Make Text Bigger. New "power usage" and "power usage trend" tabs in Task Manager. Magnifier tool increments support 5% and 10% steps, and you can choose to keep the mouse centered when using the Magnifier tool. Settings app features Sound Device properties. Swiftkey support for on-screen and touch keyboards. Disk Cleanup tool can remove file downloads from the default Downloads folder in the new Windows 10 version. Bluetooth Battery levels highlighted under Settings > Devices > Bluetooth & other devices for devices that support it. Data Usage report updated with roaming usage information. Override local settings such as currency or date under Settings > Time & Language > Region. Registry Editor features a new autocomplete feature. Settings app features Typing Insights. New Windows HD Color page for systems that support HDR. Your Phone app may be included to link Android devices with Windows 10 PCs. Font installations are now available to all users and not only administrators. Now You: What is your take on the new feature set? Find out what is new and changed in the Windows 10 October 2018 Update for the Windows 10 operating system. Beside that, task manager got blinking tree node expanders that make it a gamble to open them. Additionally, the event logs’ security descriptors are still corrupt since Win 10 RTM (copy them from Win 8.1 to fix). As usual, quite a few settings get reset on upgrade and need to be restored manually. As expected, customized cmd prompt get reset as well. Oh yes, even more errors get logged in the event viewer on system start. Okay, there’re a lot more issues, but Microsoft won’t fix and call it success. I keep all the logging and error reporting to MS turned off unless something goes wrong, then turn it on to read the helpful incomprehensible messages. I allow the OS to collect diagnostic data so it can fix local issues but that’s about it. All the data collection slows down Windows a lot. Yeah but Microsoft should reduce some contrast and make dark theme look a little softer. That’s true. Here’s hoping that they will do that before the next big update hits. LTSC and Server are the most important part of 1809 imo. And thank god they don’t do the cringy naming scheme anymore. It gets on my nerves every time I hear or read “Creator’s update”. Previous LTSBs are buggy and not really that great (still way better than consumer versions of W10 though), I’m curious how LTSC1809 will be. LTSC the only best edition of Windows 10 unless Microsoft screwes it up. Not that it matters much now that Steam let’s you play Windows games on Linux OOTB with Steam Play Proton. That feeling when new OS version gets released and the one from last year is still not stable. I’m sure fanboys will be licking their screens with the obsolete file explorer with black tint applied. Every Windows 10 version bump has come with problems for me, some small, some crippling like bsods b/c of software incompatibility or b/c of the OS itself that made me revert to the previous version. I set the defer feature update to 365 days in response, but I really wish that it allowed at minimum 2 years deferred for all its version including Home until all the bugs get ironed out. I am seriously thinking of risking buying a enterprise license on the various software swapmeet places, that technically shouldn’t be available to individuals, but the update fatigue is real. In contrast Windows 7 wasn’t the most intuitive OS, at least it was stable and it became easy to use b/c it didn’t change and you learned the ins and out of the system through repetition; basically the OS took the back seat and allowed the third party software to shine. Windows 10 is just one google search after another to relearn to do things that changes quarterly b/c MS wants to prioritize its own software that have better third party alternatives that could be installed on its older OS anyways. Win 10 Pro is OK, very different from home. Have to learn gp editor but that’s not difficult. Win 10 Home is that annoying little dog that won’t quit biting your ankle; it’s awful. Installing updates when it wants is inexcusable. * By the way thank you Martin for this advance about new upcoming version. I sure hope that the October update isn’t anywhere near as Buggy as 1803, which was a total nightmare for me, as well as many, many other users. The list is too long to mention, but it made a total mess of my system and after spending days Troubleshooting without success, the only solution was to do a Recovery, going back to the previous release. Microsoft’s QC sure leaves a lot to be desired, to say the least and having worked for MS, I can attest to the fact that Quality Control is virtually non-existent there!! So, this time, in order to save myself some major headaches, I will defer the update until reviews are posted and that the update is pretty much bug free! … and the update is irrelevant. Yes. Everything is nice must have program. the more crap they bolt onto Windows, the more difficult it will be for third-party applications to function properly. tthis in turn makes Windows less customizable and able to be tailored to individual users needs. 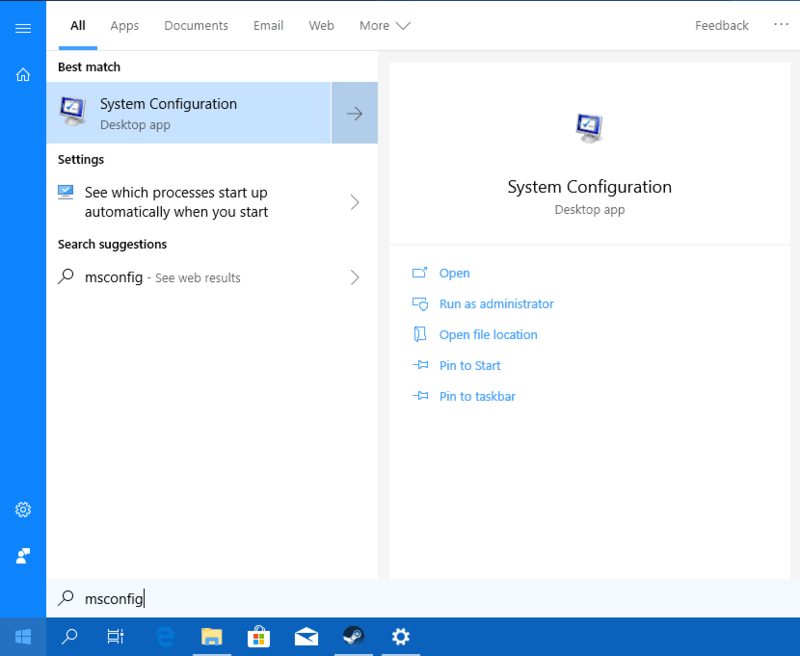 For example Cortana wreaks havoc with Major 3rd party voice software, and working around or disabling it is no easy task especially if you expect to keep your windows up to date. to the hosts file and Cortana is silenced. New Windows 10 update, now with more telemetry built-in! Glad I ditched this sinking ship. I prefer fixes over features or arbitrary changes. Very little listed makes me look forward to 1809. I hope the Microsoft Chrome Extension for Defender integration still works. The new features and changes in Win 10 Version 1809 or in any Version are not compelling enough and do not justify a major OS upgrade every 6 months or every year. ……. A major OS upgrade is justified every 3 to 10 years or longer. Remember, M$ imposed forced auto-upgrades twice-per-year in Win 10 mainly to prevent Windows Enterprise users from running Win 10 Ent for more than 18/24 months without paying extra “taxes” to M$, eg through subscriptions, Software Assurance premiums, twice-as-costly Ent LTSC license fees, etc. ……. Previously, Windows Enterprise users could run Win 7 Ent for about 10 years without paying any extra “taxes” to M$. Will there be more reports of 4 to 5 year old Win 10 Home & Pro computers running Version 1607, 1703, 1709 or 1803, being unable to upgrade to Version 1809.? = Planned Obsolescence by M$.? Of course! How else are they gonna get people to buy new Windows PCs? Is that really so different from Apple? Call it the October Surprise! Or it might be called the Hallowe’en horror if it is anything like the last “beta” – v1803 certainly has its issues, and I’m still on v1709 at this time as I’m wary of moving to what is basically a “beta” or alternatively, buggy firmware – as far as I’m concerned, IMO. Especially with v1803 completely dropping SMB1 and obsoleting the majority of consumer devices that only have that version of the protocol as an option, without providing an opt-out. There seems to be no way to get around the issue of old devices, such as my 5 NAS units (now out of maintenance cycle or firmware changes) that only have the SMB1 version of Samba available – but luckily they do have NFS available as well. I’ve had to switch to NFS to access shares from my Windows10 workstation on v1709, because I cannot find a way to get SMB1 re-enabled properly. And I’m not a newbie – I’m an expert user. No mention of the elephant in the room with Windows 10 – the vast private data collection still happening? Very few of these updates relate to the operating system itself but to all the additional unwanted bloat bundled with it. How did I ever live without live tiles, ads in the start menu, Sketch, Edge, unwanted app installations, cortana, extensive unstoppable unpaid telemetry. Thank you so much for telling us what’s new in this version. I have to admit, Im an Insider and hadn’t noticed most of these exciting additions. The ones I had noticed hadn’t blown me away actually (notably the new screen snip tool, which inexplicably is very laggy in use compared to the original one). Finally, a dark theme. My eyes will be thankful. I fail to see how a program that messes with the display color temperature which screws with the proper color perception is better than simply changing the color scheme. Nothing here of any value to me, just shuffling and replacing meh features with more of the same. That black explorer theme has been touted for a year, so what unless you work in a dark area? MS has made it sound like a major accomplishment. There are already accessibility mods that do that. 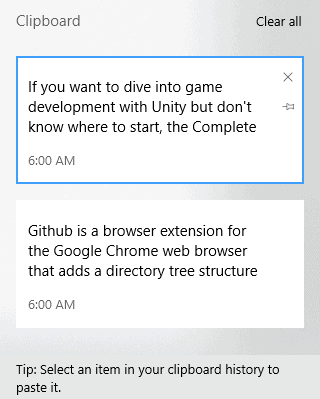 I’d like the annoying explorer behavior of scrolling files to the bottom of the window every time you open and close one to go away. I want files and folders to stay where they were when they were opened. It would also be nice to easily be able to change inactive window title bar colors and text as you could way back before XP. MS is supposedly focusing on getting their software to work on any OS and a bunch of free thinking initiatives; sounds like desperation. Maybe they’ll quit screwing around with Windows. Not! Beside Windows, we use exactly zero microsoft software. Ten years ago, we used a lot of MS software. All the stuff we store online now is in space provided by our paid encrypted email provider. Mainly because we don’t trust any of the mainstream companies’ integrity. Very fast and always there, what a concept! I love my kit kat and I’m not changing to lollipop or anything else! Gotta give credit to whomever got the idea that the things preschoolers adore would be a hit. “Give him the phone and he’ll stop crying…” Genius! I’m not interested as the quality of MS’ coding is shocking. Have they fixed it so that one can select text using the stylus on a system which has touch input easily? What about using the stylus as a mouse w/ legacy applications on systems which also have touch? Both of the above got broken in Fall Creators Update and I’ve had to roll back twice now. I don’t care about Windows 10….i care about Windows 7. If You write how to do something in Windows 10, then do the same for Windows 7 ! Windows 7 will be supported quite many years to come (at least spring 2021) ! Still this ridicilous Windows 10 Malware Edition seems to come first on this site….. Martin, time to wake up !!!!!! I think it’s going to be more than that :) Windows Embedded Standard 7 is supported until 2025 (same as Windows 10) and Windows Embedded Compact 7 until 2026. You can search on google for “windows 7 embedded end of life” (without quotes) and it will give you the EOL for these releases. Some minor improvements but nothing of real interest here – as John G also mentions, certainly not enough to mess up users’ systems once again with a supposedly “major” upgrade. I think I’ll skip this one altogether, 1803 is barely acceptable and I regret not sticking with 1709. When will Microsoft fix the bug of taking ages to create new folder, copy file, delete file.. (right click..) in Windows 10 ? Use linux (I use mint xfce) and you’ll get to choose exactly how you want your desktop. And everything else. No more begging M$ for features that don’t generate them money. I have been unable to see a “single” thing on this list of changes, that matters to me….or where I have not got that base covered already. If anyone else sees things for them, that they find helpful, great….but its simply not worth the risk to allow updates for anything shown here. And can you imagine (I don’t want to), the nail-biting wait, to see what is left of your system, while gigabyte sized code is effectively replacing, more or less, your entire operating system. No thanks. Not for me. I would not want a single setting undone. Almost any messing about with my system would be a deal breaker, especially if the end result is a list of rubbish like is shown here. As is often the case, third party tools (like the most excellent CopyQ clipboard managers) are far better than the limited, poorly thought out Microsoft “initiatives”. Yes, this is another thing that ULBOOM seemed to allude to above: you also just can’t trust, from a three letter agency point of view, exactly what kind of “compromises” may have been made to the integrity of your system, after an update. Even if MS’s update system was not so broken and buggy, the fact still remains, that when you more or less replace an entire OS (rather than just patch it), and when you don’t document very much, if at all….and what you do document is obfuscation and limited, at best….then you have to conclude that your system will almost certainly be backdoored, if it wasn’t already….you just have no idea what’s been done do you? MS already bypass HOSTS for many things, and that is pretty devious is it not? Hard-coded bypassing of HOSTS would lose trust for many people, from the get-go. Insane what direction this company has been going in. It really annoys me. @ Sean Walker – yes……SMB1 dropped now. If that had happened to me (I’m frozen on 1607), it would have totally screwed up very vital functions in my home network…and a variety of devices my systems need to talk with peripherals. I appreciate SMB1 is a vector for trouble, but “I” would like to have the choice of whether the things I need it for, outweigh the risk…surely? Why should Microsoft take that decision, and in two seconds, have wiped out things that are integral to the way I work? At least, offer that as a switch, that can be turned back on again, as it is now….but default it to off. As always nanny-Microsoft seem to know better than we do. I am endlessly backed up and cloned, so while I don’t want abuse of SMB1, ultimately, I can sort that issue out if a problem arose. What I don’t need is functions being taken away without any choice. To anyone wondering, Pro RTM and Pro VL are the exact same operating system. Once activated a copy of 7 Pro, the license decides whether it goes the RTM or the VL channel. If MS won’t push those updates, you can be sure using something like Simplix Update Pack or WSUS Offline will do the job just fine. Also, Windows 7 Embedded Standard and Compact are supported until 2025 and 2026. Idk about Compact, but Standard is practically a modular Ultimate. Please delete it if you can, Martin. I posted it in the right article too.